Wooden trinket box with metal ornamental lid. AVON German Shepherd dog brown glass perfume bottle. STAR WARS: THE FORCE AWAKENS BLACK SERIES DIE CAST KYLO REN & POE DAM, 2015. Large jumping trout or salmon AVON 1968 green glass bottle perfume aftershave, 7-1/2" tall. Oleg Cassini Salt & Pepper Shakers in white elegant porcelain design. 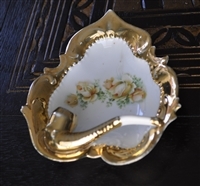 Heart with gold rim Pipe decorated dish from Germany.